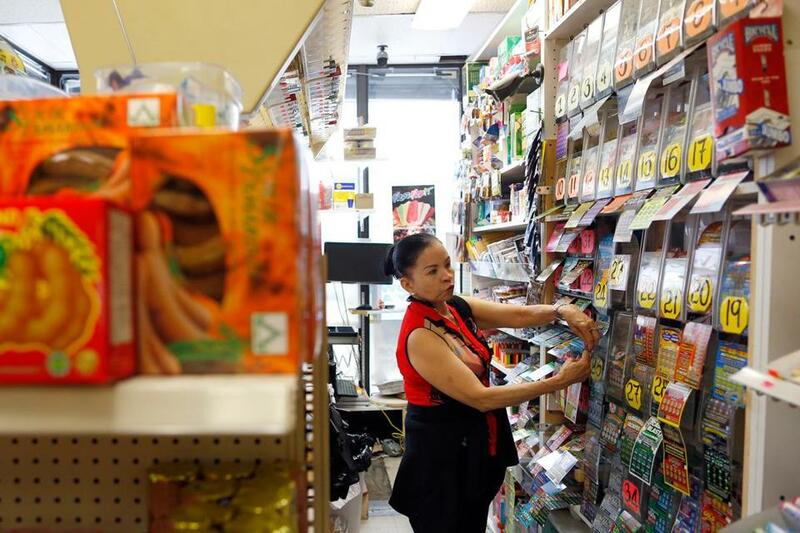 Teresa Nguyen gave a lottery ticket for a customer as she worked behind the counter at Tan-Thang Market on Broadway in Chelsea on Wednesday. CHELSEA — The line at Tedeschi Food Shops on Washington Avenue extended to the door on a recent Tuesday afternoon as several customers waited to try their luck with a $2 scratch ticket. Though Chelsea is one of the poorest cities in Massachusetts, its residents are among the most enthusiastic lottery players in the state, spending an average of $1,179 per man, woman, and child on tickets last year, according to state records. But Chelsea is one of the biggest lottery losers by one key measure: the amount of local aid the city receives from the lottery. In 2013, tickets sold in Chelsea generated $8.2 million, but the city got back only $6.9 million because of a formula that critics say favors affluent towns. A Globe analysis shows that 189 municipalities pay more into the lottery’s local aid fund than they get back as aid, including 58 where the median household income is below the state average. Many lottery losers are faded blue collar communities such as Revere and Haverhill, or communities on Cape Cod where summer residents give a misleading impression of the year-round population’s wealth. Who wins and loses in the Mass lottery? Meanwhile, affluent towns such as Brookline and Milton receive millions more in local aid than residents pay into the fund through lottery sales, largely because the aid distribution formula does not penalize towns that buy relatively few tickets. In all, 162 municipalities received more aid than they contributed to the fund through lottery ticket sales. “They should give [the money] to people who need it — not people who drive Cadillacs,” said Tom Powers, a 62-year-old Chelsea resident who spends about $35 on lottery tickets each month. The lottery aid formula was set up to distribute more money to communities with the greatest need, but need is measured in terms of population and property values, which economists say can be misleading. Massachusetts officials have tried — without success — to address what critics see as the formula’s flaws, including a recent effort by Governor Deval Patrick to shift more aid toward poorer communities by considering municipal income levels in the aid formula. One longtime overhaul advocate, former mayor David Ragucci of Everett, took his critique a step further in the early 2000s by proposing an Everett-based lottery that would allow his hard luck city to keep all the money it raises from selling tickets. But Ragucci’s idea was quickly shot down and efforts to change the statewide aid formula fizzled, in part because it would raise payments to some communities at the expense of others in a time that overall state aid is declining. How does your community fare with lottery aid? Local aid was a major selling point of the Massachusetts State Lottery when it launched in 1971, eventually generating billions in ticket sales annually. Twenty percent of the value of every ticket is used to pay for a program called Unrestricted General Government Aid, which provides local aid to cities and towns. Municipalities use this local aid, which totaled about $900 million in 2013, to repair roads, fund school programs, hire police officers, and pay for other services. And lottery officials are quick to stress that they don’t decide how the money should be divided. In general, the most aid goes to lower income cities such as Fall River, where the median income is more than $30,000 below the state average, and residents receive $6.5 million more each year than the city pays through lottery sales. However, many economists and municipal officials believe that the current aid distribution formula falls short in communities where residents buy a lot of lottery tickets and where property values are high but incomes are not. Inequities are especially pronounced on Cape Cod and the islands, where several communities received little aid despite low median household incomes and high poverty rates. The expensive vacation properties inflate per capita property values, said Bo Zhao, senior economist at the New England Public Policy Center of the Federal Reserve Bank of Boston, even though year-round residents use the majority of the municipal services. Plymouth, for example, was given just $59 in lottery revenues for each of its more than 56,000 residents, compared to like-sized Medford, which received $183 per capita. Zhao argues that the formula needs to focus aid distribution on what he calls the municipal gap, or the difference between the cost of services and the ability of that community to pay for them. In calculating the municipal gap, Zhao includes metrics such as population density, poverty rate, unemployment rate, and the number of per capita jobs. By his assessment, Everett needs about $1,061 in aid for each resident while Brookline has more than enough resources, leaving no funding gap at all. In 2013, however, Everett received $140 in per capita state aid compared to Brookline’s $91. Many municipal officials, particularly those in low-income cities and towns, say the state has a moral obligation to change the formula since the lottery falls like a regressive tax on their communities. Urban municipalities with lower median household incomes, such as Worcester and Lynn, were among the top sellers of lottery tickets in Massachusetts in the 2013 fiscal year. Social scientists have long drawn a connection between poverty and lottery gambling. People living in poverty play the lottery at higher rates and are more likely to spend a larger percentage of their earnings on tickets, studies say. “They should look at where the money comes from,” Anzuoni said. The City of Chelsea continues to struggle financially, in part because of low state aid, said Jay Ash, the city manager of Chelsea. The city has had to defer police hires and decreased the number of teachers in classrooms to combat the budget shortfalls, said Ash. ”We would like to spend more on those items and are not able to do so because state aid is lower than it was in mid-80s,” said Ash. But the lottery business at retailers such as the Tedeschi’s store on Washington Avenue remains profitable, through a steady flow of $2, $5, and $10 scratch tickets. • Who wins and who loses in the Mass. Lottery? Evan Horowitz of the Globe staff contributed to this report. Catherine Cloutier can be reached at catherine.cloutier@globe.com. Follow her on Twitter @cmcloutier.